Everyone knows how the City of Salt in Wounds came about. But for those who have not visited in person, it is hard to conceive of the scale of the place. It is even harder for outsiders to understand how wholly the economic engine of butchering the bound Tarrasque has transformed the society of Salt in Wounds and reshaped the surrounding landscape. for dozens of leagues, and the ground occasionally trembles as the creature at the core of Salt in Wounds thrashes. Most times, the God-Butchers and Marrow Miners keep the creature unconscious but even they -toiling night and day- can not extract enough to keep the creature down every hour. Drawing closer, the traveler will notice the shift in ecology and weather; the deciduous forest with its seasonal snows gives way to a humid, almost tropical zone. The temperature for the surrounding area keeps steady at 80 degrees or higher, sometimes reaching into the hundreds even in the dead of winter. However, the tropical plants here are unique, twisted and changed from ground soaked in red. Travelers should be aware that from this point on, the water is no longer safe to drink – Salt in Wounds is provided with imported water carried into the city at great expense. Very quickly even experienced mages will discover that magic functions differently in and around Salt in Wounds, possibly of result of the Tarrasque’s legendary resistance to magic seeping out with its vital fluids and essence into the land now thirsty for its blood. By the time the traveler can see the walls, they will also see the beasts horns peaking up above even the tallest towers built by the Binder-Lords of Salt in Wounds. The air above the city is blackened with a swarm of stirges and hungry gulls cawing to swoop down for scraps from the never-ending butchery. 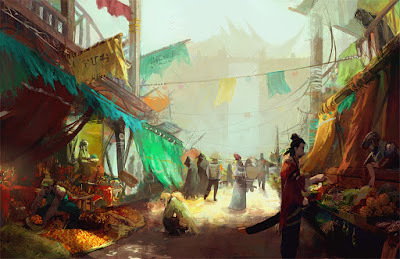 Salt in Wound’s famous marketplace -The Throat- extends far beyond its gates, and even a mile outside the city the traveler will be assaulted by innumerable merchants hawking their wares. Entering through the main gate, visitors must press through the rich market to gain access to the rest of the city. This chaotic bazaar known as the Throat continues almost to the processing core of Salt in Wounds itself; the fortress Salzinwuun around which the rest of city was built. Of course, a large number of merchants are involved in the selling & buying of water and Tarrasque byproducts, but nearly anything can be bought or sold in Salt in Wounds: slaves, drugs, all manner of vice – even the rare goods that are technically illegal are generally tolerated if the sellers and buyers can learn to behave themselves and pay off the right House Militia Captains. To the north in the city, in the Beast Crown District, are the manor-towers of the Binder-Lords. Most of these hereditary oligarchs can trace their lineage back to the original adventurer heroes who bound the Tarrasque; their authority derived from knowledge of one of the 13 Command Words that can release one of the immoveable harpoons which keep the Tarrasque bound. Rumors of the decadent excesses of these aristocrats run rampant throughout the city, the most salacious of which involve secret orgies fueled by blood wine where biting, cutting, & feral bloodletting intermingles with the carnal merging of bodies – a cacophony of violence, hunger, and lust that can last for as long as the blood wine continues to flow. The core of town is dedicated to the eternal harvest itself. Scattered about the Tarrasque are hundreds of workers cutting at the beast, clearing the massive charnel sluices of obstructions, operating cranes to move the larger pieces, or extracting small pebbles, subtle glands, and tiny excretions of alchemical reagents. 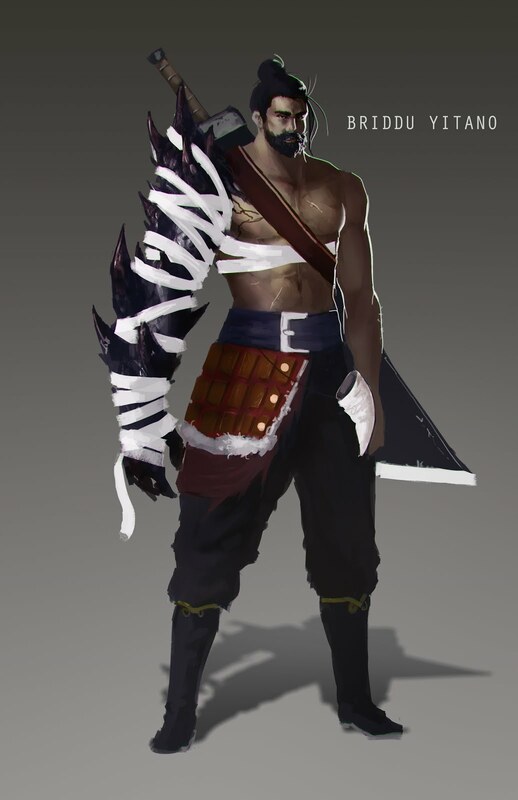 Overseeing it all are the God-Butchers, hulking figures with huge adamantine or Tarrasque bone greatswords strapped to their backs, screaming orders with mouths stained red with skin-chaw. Care is needed here, as bloated ramora fleas (roughly cow-sized parasites turned predator from long gorging on the Tarrasque) sometimes spill out into the city. Everywhere is the stink of meat cooking, piss being boiled in huge vats, fat being rendered into its base components. When not drowned out by the calls of the beast, the city is loud with the hungry calls of men and other carrion eaters. Depending on what section of the city you find yourself in, roughly 1 in every 10 citizens may be horrifically mutated or disfigured. The southeastern section of town is currently referred to as the ‘Tail Stones’ district. This area is still mostly in ruins since the 12th Meridian Crisis, when the beast managed to briefly free its tail: whipping at the earth, stones & machinery behind itself and sending these projectiles hurtling through the air to smash innumerable city blocks like the work of a thousand catapults. While ‘safe’ now, only the desperate and impoverished reside in the Tail Stones. There are also over environs, notably Sage’s Row dedicated (primarily) to alchemical research as well as small districts dedicated to particular classes, professions, or even races. Each one of these contains secrets and intrigue well beyond the scope of this slim guide. 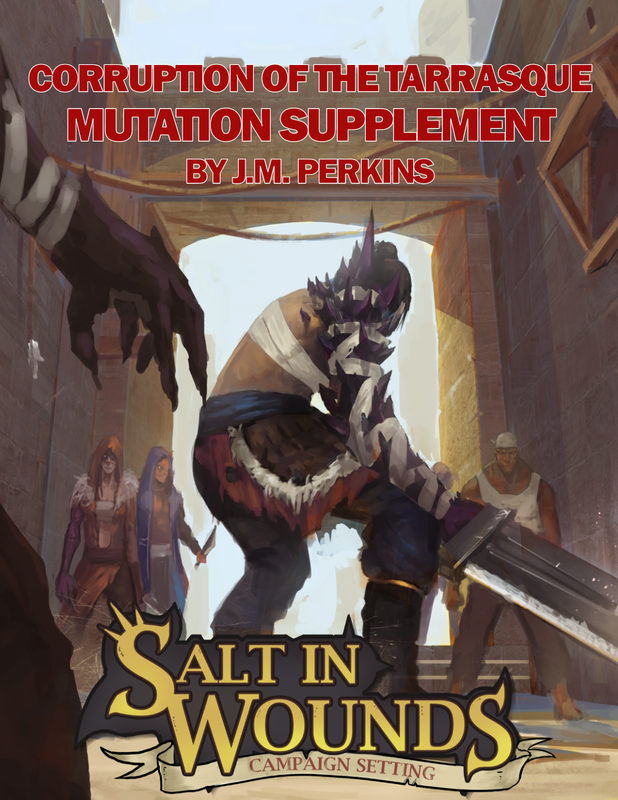 Salt in Wounds Kickstarter is Live!